In an emergency or survival situation, the Yucca leaf can be used to fabricate a rudimentary needle and thread. Yucca plants with the broad style leaf work better than those with the thin leaf, although the latter can be used. Remove a leaf from the Yucca plant, cutting it at its base to maximize the length. Being careful not to damage the needle tip of the leaf, take a rock and pulverize the leaf from the base of the point all the way down the length of the leaf. Do not pound too hard as this can damage the fibers making the thread weak or useless. 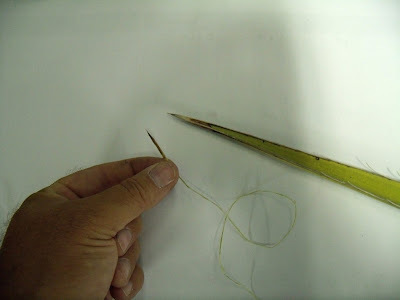 Next, using a knife or sharp rock, cut around the base of the needle to where a few fiber strands are still connected to the needle tip. If water is available, you can wash the leaf by rolling it lengthwise between both hands. This not only allows you to separate the needle with thread attached, you now have fibers that you can use to twist into cordage. If no water is available, carefully separate the fibers at the base of the needle to where one strong strand remains at the base of the needle. The needle tip can be carved around the edges if it is too thick.A small pocket knife makes easy work of this. Tie a knot at the bottom of the thread opposite the needle end. You can now use this Yucca needle and thread to repair a torn jacket or ripped jeans, which should hold long enough to get them properly mended. Make as many needles as needed to get the job done and carry spares.